The Clove Club is the newly opened venture from the team behind Upstairs at the Ten Bells, Clove Club and various other pop ups in East London. Located in Shoreditch Town Hall, lunch was served in the bar at the front, a plain but comfortable space based around a central bar area. Only a lunch menu was available, offering a number of starters and 3 mains, a beef dish, a hake dish and a vegetarian option. The starters included a number of vegetarian dishes too. Bread and salami's plates are also available. We started with a cocktail, an orange based brandy spritzer for my wife and a blend of tequila, mezcal and agave for me, quite a kick on an empty stomach relatively early on Saturday but a nice combination. 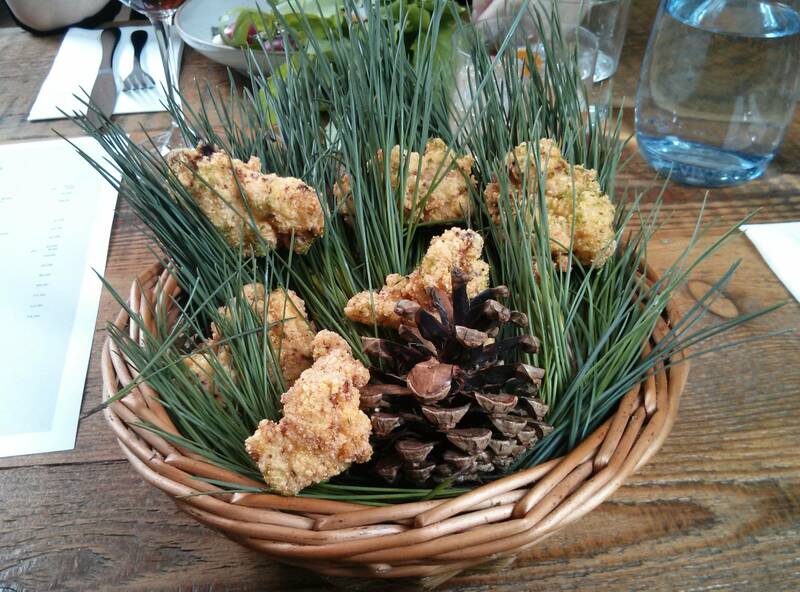 I started with buttermilk fried chicken and pine, the dish a basket of pine needles and pine cone in which were nestled a number of golden fried chicken pieces. This was great fried chicken, hot and crunchy on the outside, moist, well seasoned, with just a hint of pine salt to add a unique stamp to a ubiquitous dish. 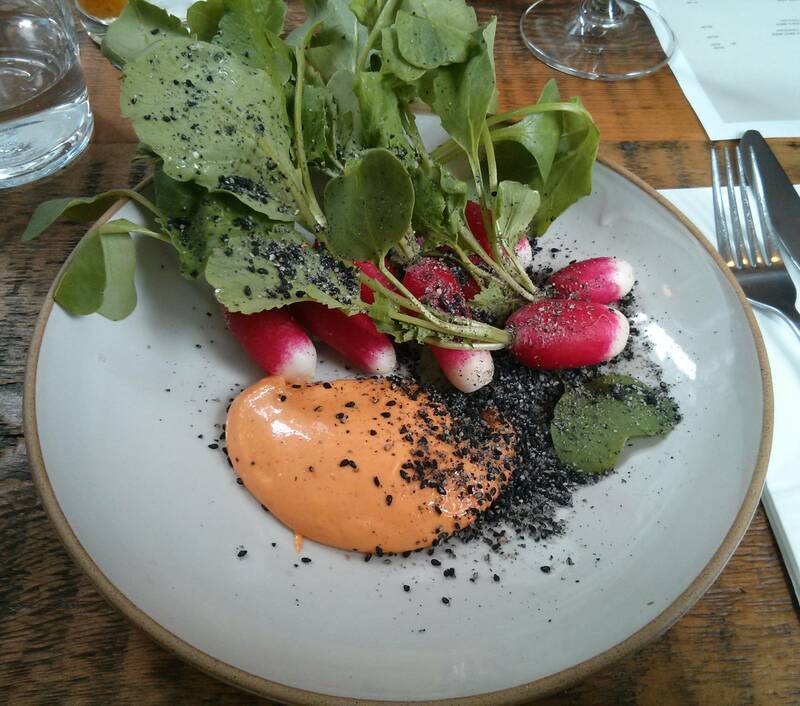 My wife had a dish of radishes, gochuchang and black sesame. 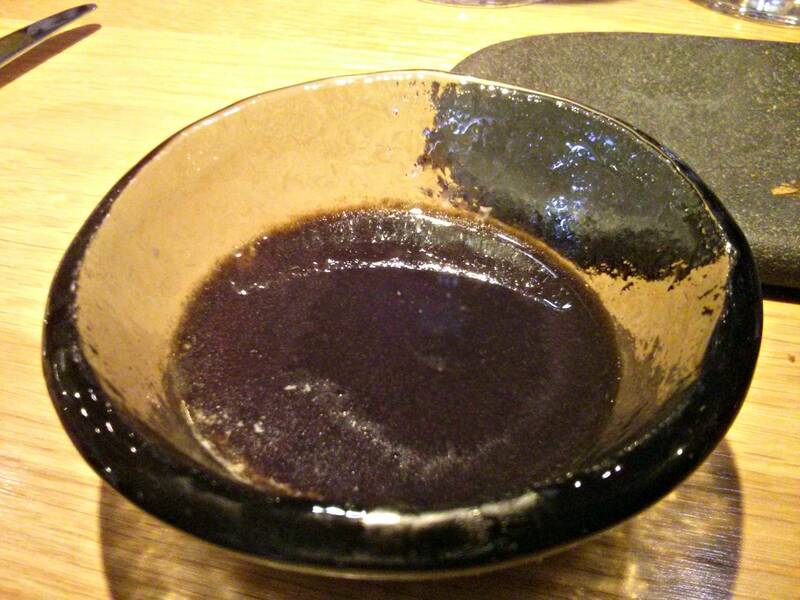 Gochuchang is a Korean fermented mix of rice, chili, soybeans and salt, in this case mixed with mayonnaise and partnered to rough ground black sesame to provide a spicy and tasty dip for the radishes, which were eaten whole, leaves and all. Although basic, this innovative starter combined a number of unexpected ingredients to pleasing whole. 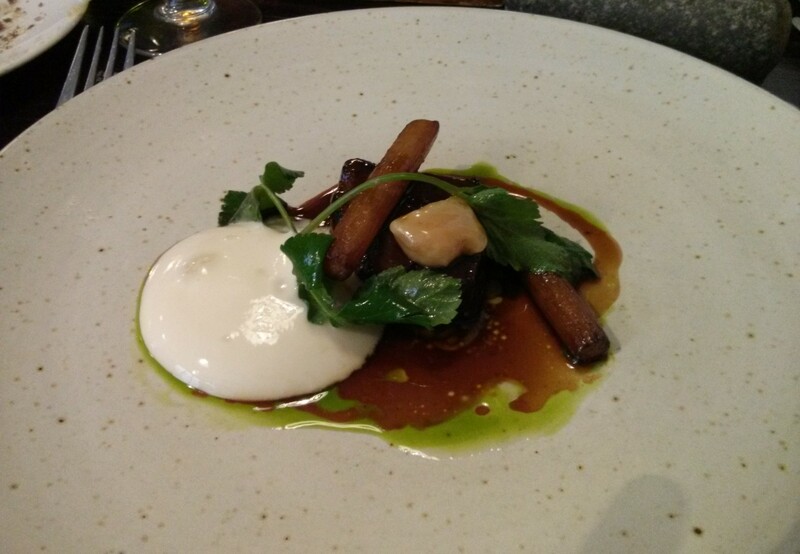 Our mains followed, mine a fabulous smelling plate of beef, ramson, mushroom puree and fried potato. 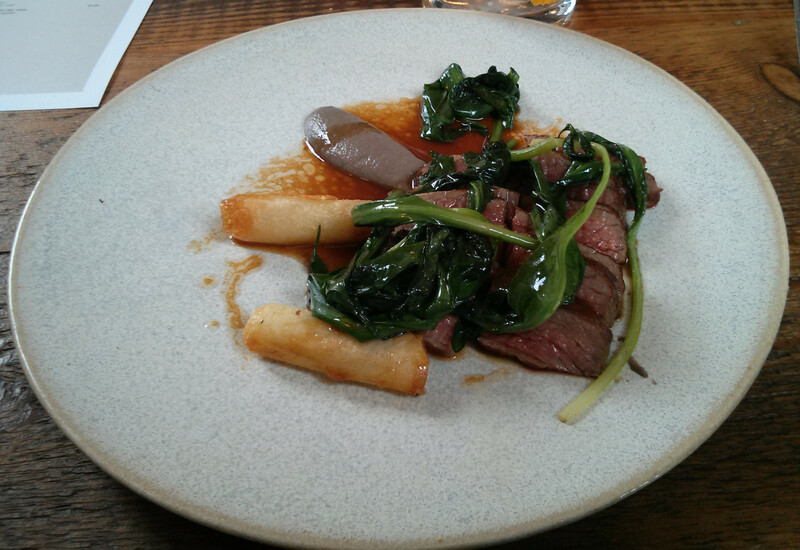 The beef was a nice bit of rib, grilled medium rare backed up with a seriously tasty gravy and some excellent ramson (wild garlic). The potato were rolled up slices of thin potato, fried crisp golden brown in butter and exceptionally good, although let down by there only being two. I had loads of gravy left at the end and half a dozen would have been perfect, in fact you shouldn't be allowed to make potato this good and not give me a big bag of them. 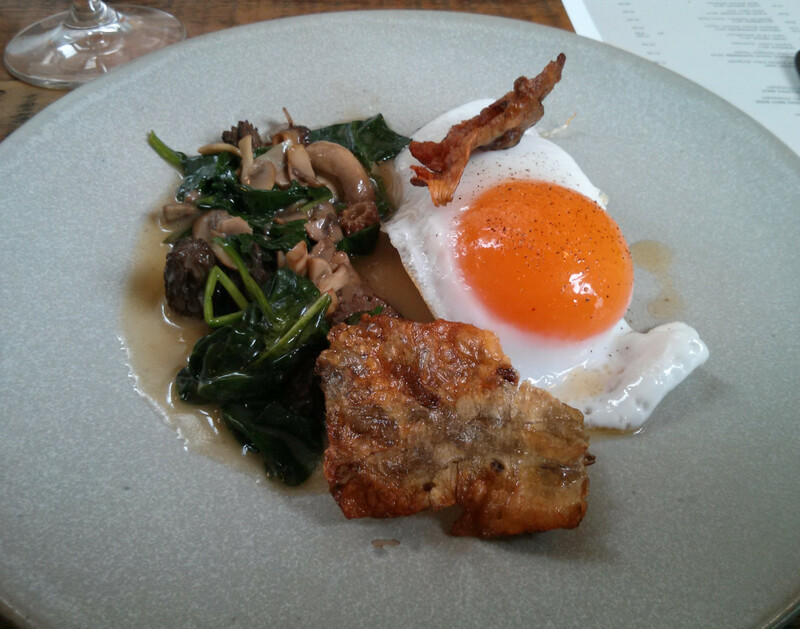 The vegetarian option was fried ducks egg on a bed of jerusalem artichoke, jerusalem artichoke crisp, morels and spinach. The morels although small and mixed with button mushrooms were well flavoured and very buttery, the artichoke held its earthy flavour well and the egg and yolk helped to bind it all together in a pleasing fashion. 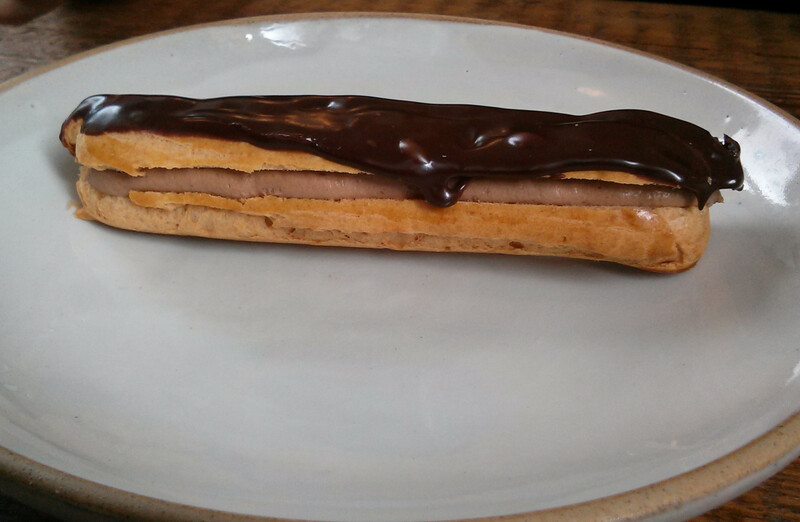 Dessert was a pretty good chocolate eclair for my wife, with a surprisingly crunchy choux pastry and filled with a chocolate cream, topped with a ganache with a decent shine. I had a pile of caramel ice cream, barley and oats. The ice cream was creamy and smooth, and matched well with the crunchy oats and malted barley and was a tasty combination. The Clove Club is a great addition to the vast choice available in that part of town, and the full menus of the evenings have some intriguing and appealing sounding dishes. Vegetarians are well catered for, a vegetarian tasting menu being available in the evenings too. Our bill came to £69 including service. Buttermilk fried chicken and pine. Rib of beef, ramson, mushroom puree, potato. Duck egg, jerusalem artichoke, morels, mushrooms and spinach. Caramel ice cream, oats. barley. Hedone is the restaurant of Michael Jonsson, a former food blogger and ingredients consultant who opened in 2011 and went on to win a Michelin Star in short order, along with a veritable tsunami of praise from critics, bloggers and food lovers worldwide. Michael Jonsson has scoured the UK and Europe to source the absolute best produce available and the ingredients available that day drive the menus. After a two hour journey across London we arrived and sat at the bar overlooking an open kitchen, which takes up quite a bit of the brick walled room. The kitchen is a full working kitchen rather than a place to plate up in front of guests, with the pastry and amuse bouches being prepared right in front of us. Although I would hate to work under the gaze of my clients, as a punter I enjoyed watching all that went on, from the raw puff pastry for the mille-feuille being prepared at the start of service to the loading of NO2 charger for the mousse during plating up. Behind the central bench was the pass and main cooking area and you get an idea of what was being prepared, and just how many pans are needed for a single plate of food. The menus gave a choice of a la carte, a tasting menu and 'carte blanche' where you sit back and let chef choose. We went for a vegetarian and non-vegetarian carte blanche menu. The server went over to the chef and he put together something suitable for us, the menu entirely dependent on what was available that day, and can even vary by number of courses if requested. We were then asked if we wanted any hints to what we were having, or if we wanted to leave it a surprise, and opted for the latter. Canape's arrived first, a tart of smoked haddock and dill, I'd watched the smoked haddock being sliced earlier, the fillet a lovely hue of yellow and white and held a great depth of flavour, foie gras in some razor thin rye, creamy and rich, and a parmesan biscuit, intense with cheese, topped with a tart berry disc. After this the bread was served. I came armed with knowledge of the bread being seriously good here, and as I watched (and more importantly heard) it being sliced right in front of me I knew I was in for a treat. It was indeed as good as you can get, incredible smell, perfect crust, huge depth of flavour and texture, a masterclass in baking. 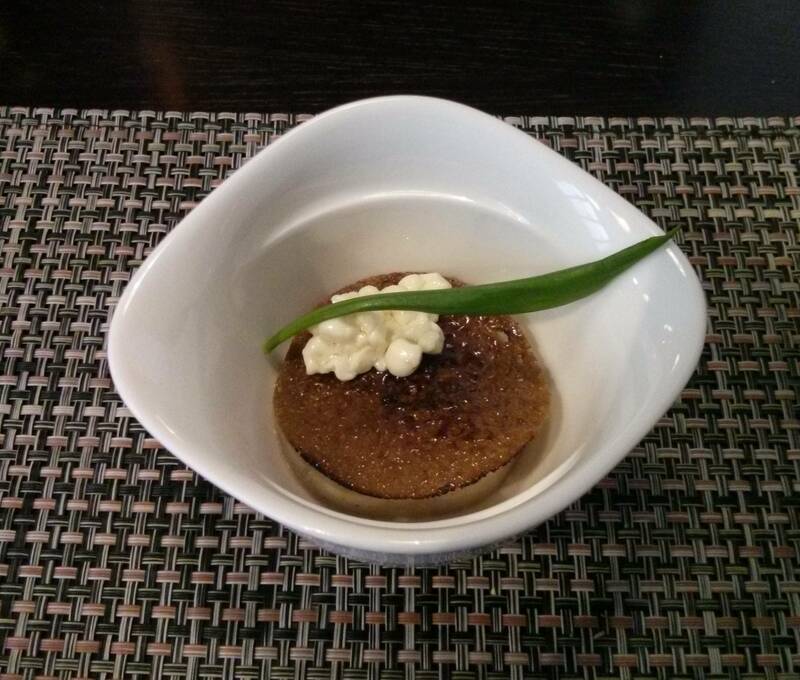 The amuse bouche was small dish of umami flan, a custard flan with a seaweed sauce on top. This was intensely salty,savoury, rich with iodine and the tastes of the sea which I enjoyed, although my wife finished it, wasn't sure if it was her thing. What can be a better way to celebrate the start of a meal in spring than some of the classic ingredients of the season? 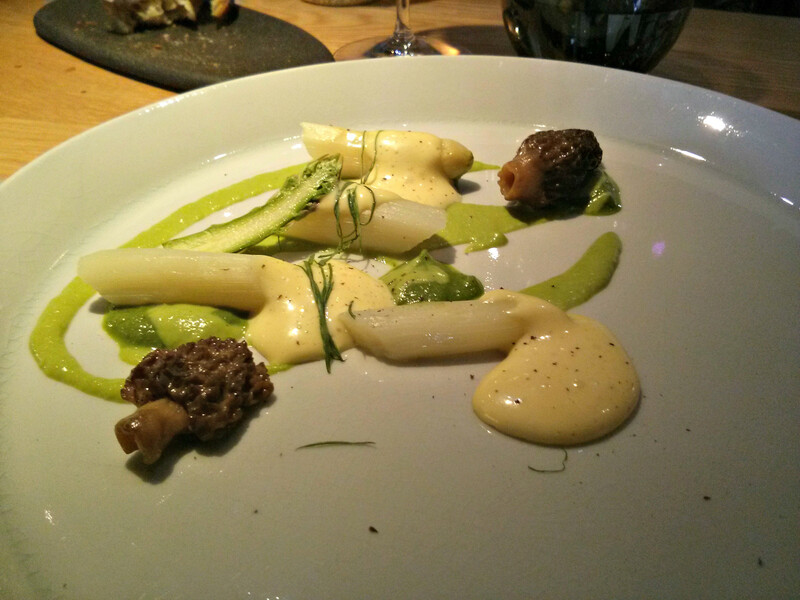 Large morels, white asparagus from France and a shaving of green asparagus came with hollandaise, fennel and a sprinkling of cardamon. With a simple dish like this, the ingredients themselves become the star, the providence of their sourcing is evidenced with each mouthful, excellent examples of how vegetables and fungi should taste. Next up, a wonderfully fresh piece of turbot, this came with crushed smoked potato, a potato skin emulsion and a shavings of the last of the winter truffles. 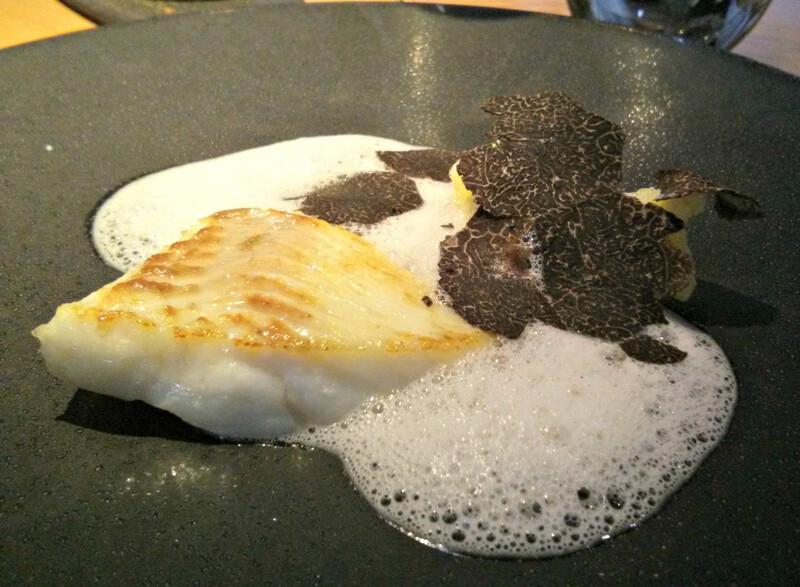 The emulsion had a nice depth of flavour and together with the truffle and potato accompanied the turbot most excellently. My wife had a ducks egg yolk cooked sous vide for 2 hours, a base of the raw/barely blanched green asparagus, more truffle shavings and truffle sauce. 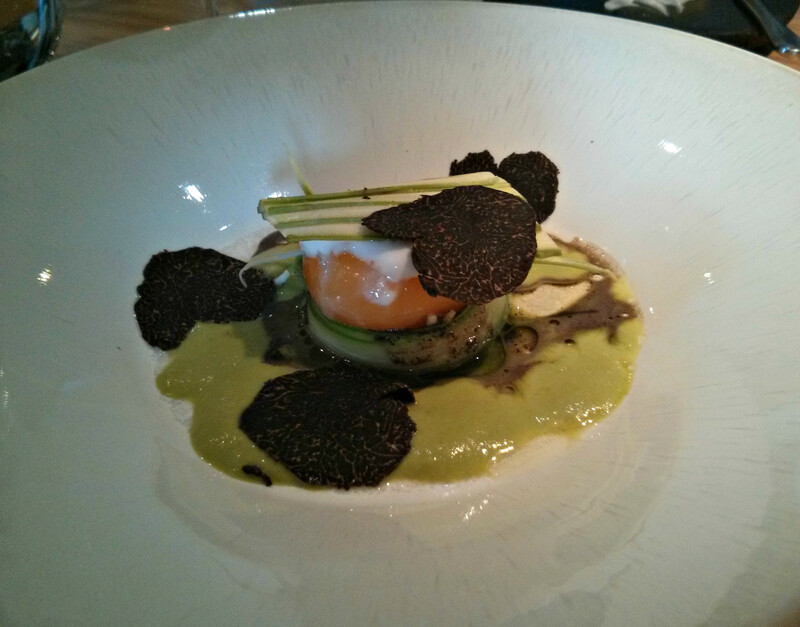 The yolk was dense and sticky, coating the fresh bite of asparagus to add a unctuous richness, with the truffle providing a earthy note to the dish. Following this a single langoustine in a shallot, celery and herb broth. 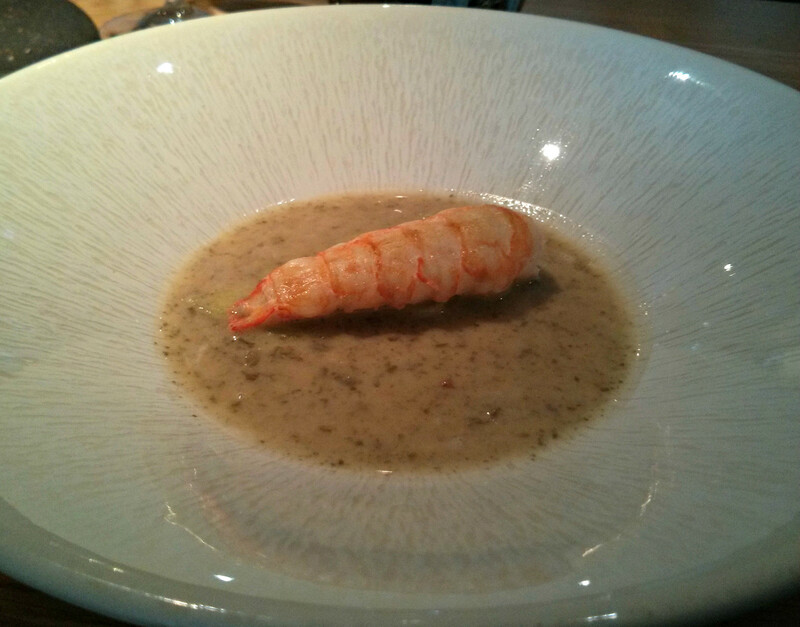 The langoustine was very nice, sweet and juicy with the onion sweet and broth intense. My wife had a lovely looking plate of carrots. 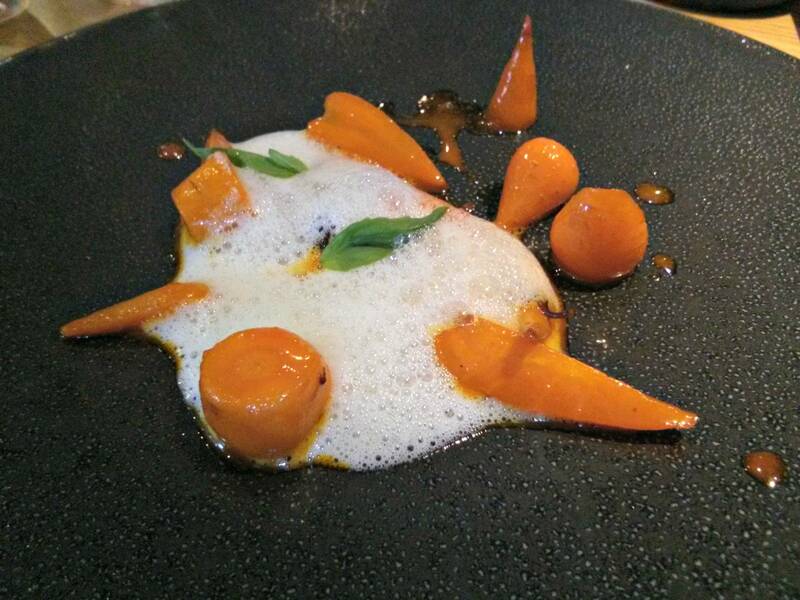 The carrot dish was truly excellent, the carrots of exceptional quality, with an interesting foam, the taste of which was familiar but I couldn't identify it with the single taste I had, and really unusual sweet glaze. Although I loved the turbot, the carrots were so damned good I wish I had this instead. Next up was possibly one of the dishes of the year, Liquid Parmesan Ravioli. 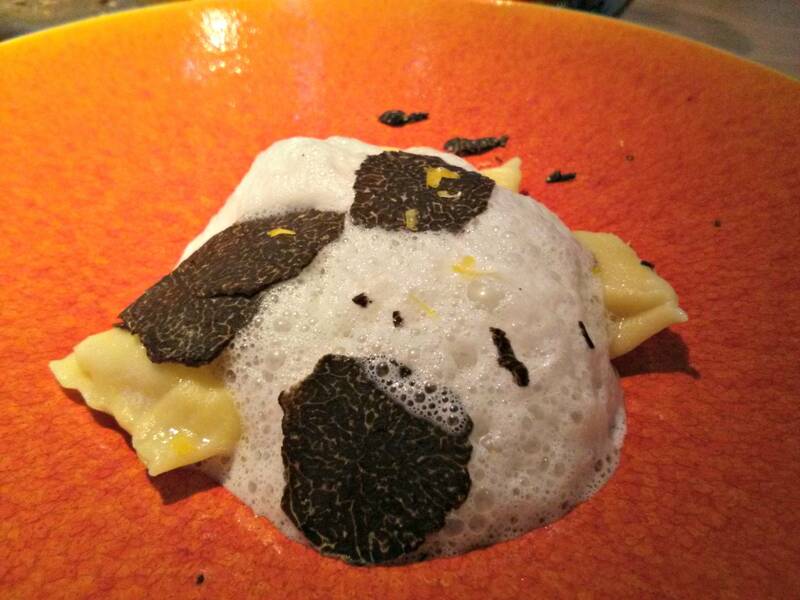 A number of ravioli were covered in a frothy horseradish sauce, lemon rind and yet more shavings of truffle. Like the xiaolongbao I've had recently these were best eaten whole due to the liquid parmesan centre. A ravioli, truffle slice and generous helping of sauce were piled on a spoon and what a mouthful it was, the liquid parmesan filling the mouth with a buttery flood of superb, really fantastic quality parmesan. intense with umami, perfumed with the truffle and hint of horseradish and lemon. This was dish of the highest order, both my wife and I adored this course. The first of the main courses arrived next, for me rack of salt marsh lamb served very rare, baby aubergine, endive and smoked aubergine puree. The lamb was incredibly well flavoured, a prime example of its kind, the sauce distilling the essence of roast lamb into a sticky coating on the pink meat for the perfect bite. 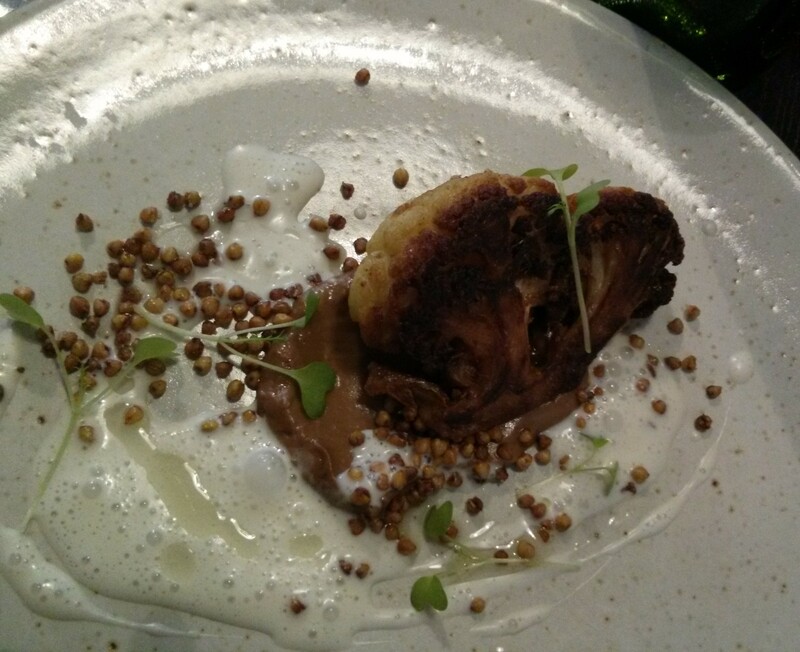 The smoky aubergine puree was excellent, and partnered the meat perfectly. My wife had some of the same ingredients, but instead of lamb some lovely ramson (wild garlic) and a garlic sauce. The baby aubergine and endive were brushed with miso and roasted but retained a good crunch, and retained their fresh flavours. I didn't think anything could top the lamb but my final main was possibly my favourite of the lunch. A huge slice of duck breast, again served very pink was accompanied with beetroot served a number of ways, a puree of red beetroot, roasted golden beetroot, smoky white beetroot and some discs of pickled beetroot. The duck, on its own one of the finest Ive had, came with an offal sauce enriched with foie gras. The sauce was quite rich with liver taste, on its own with the duck it was quite strong, but when combined with the sweet beetroot puree it was absolutely heavenly. 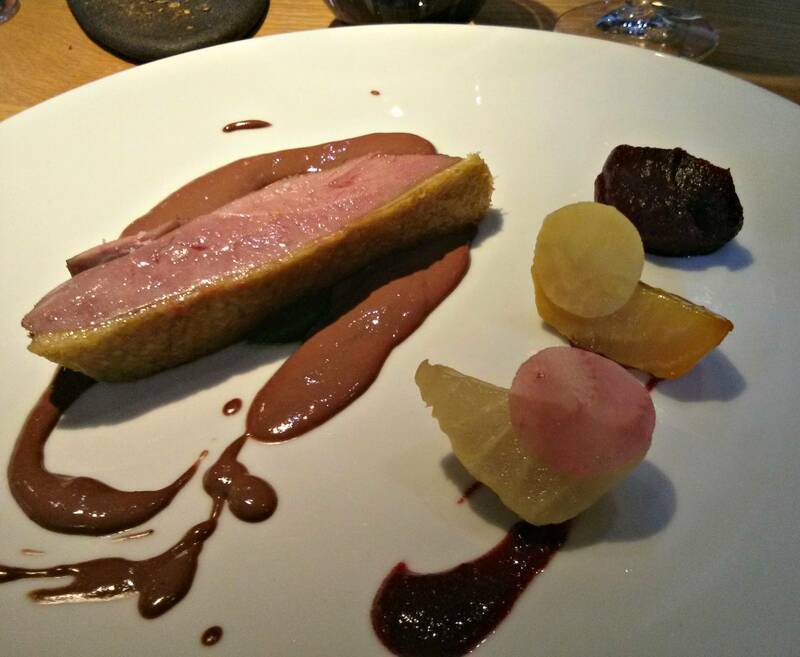 Each variation of beetroot gave a distinct but differing addition to each piece of duck, sauce and puree. 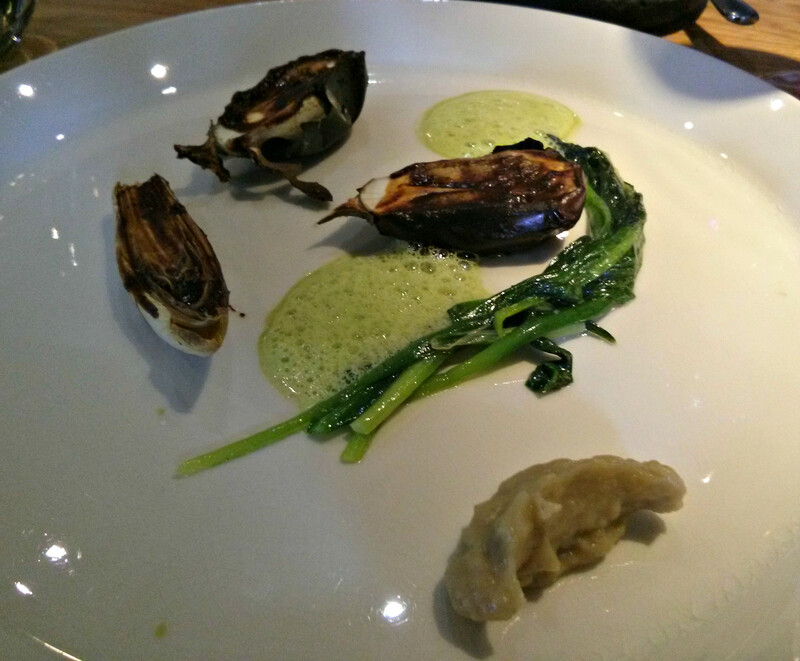 I loved this dish, especially the way it each element combined to such good effect. 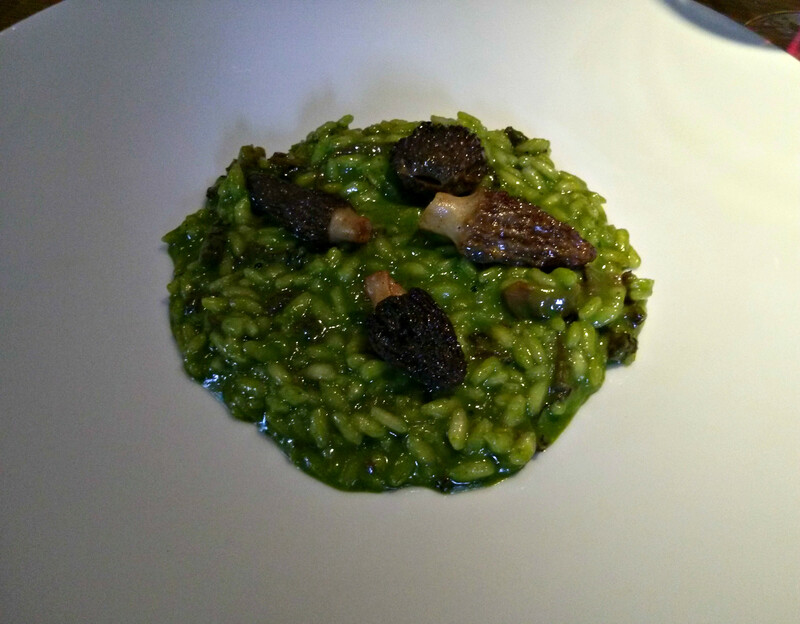 My wife did not miss out, with an excellent risotto of watercress, morels and parsley. This was very well cooked risotto, redolent with taste of spring, retaining the peppery kick of watercress and garden fresh parsley throughout, with a welcome return of those superb morels. We were asked if we wanted cheese and a dessert or two desserts and went for two desserts, although the cheese courses were being prepared in front of us and a number of excellent cheeses were available. 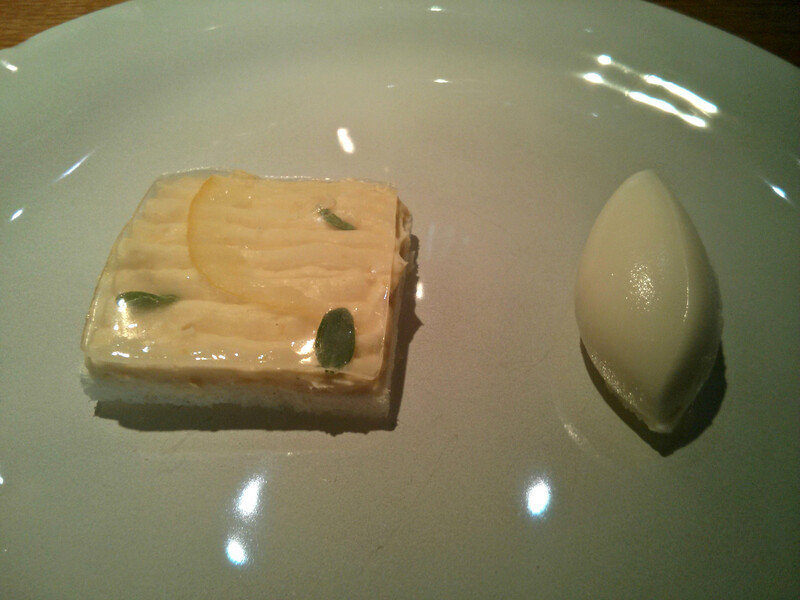 The first dessert was variations of lemon, a lemon sorbet, a meringue square topped with mousse, gel and some lemon thyme leaves. Again sourcing proves itself, with superb lemons being used and all elements providing a wonderful palate cleansing effect. 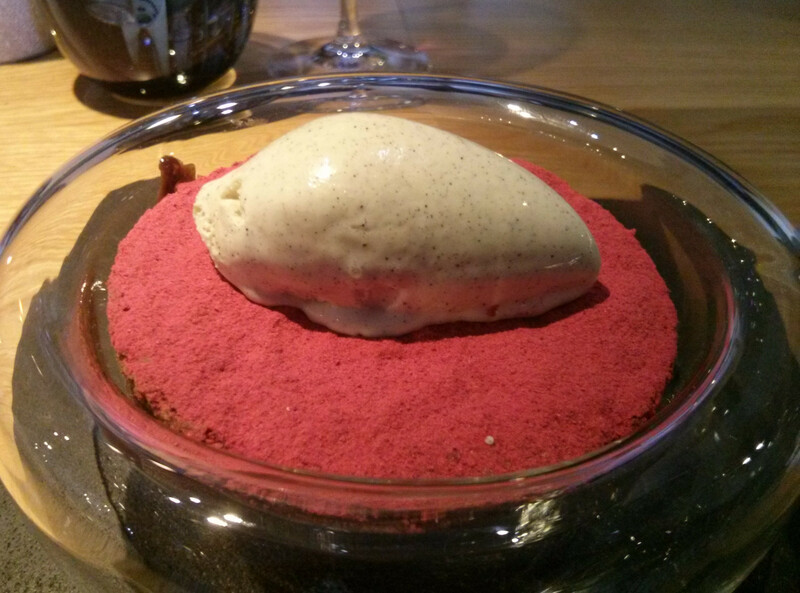 The second dessert was chocolate dish, a bowl with some passion fruit sauce was filled with a warm chocolate mousse from a NO2 charger, this was topped with some discs of chocolate biscuit that had been covered with raspberry powder, on top of this a quenelle of vanilla ice cream. The warm chocolate mousse was incredibly light but rich with chocolate, the raspberry astonishingly well flavoured, intensely tart and holding the raspberry taste even against the superbly rich mousse. The vanilla in the ice cream again was of high quality matching well with the other elements. This was a very special pudding, we both really enjoyed this and one of the best chocolate desserts I've had. 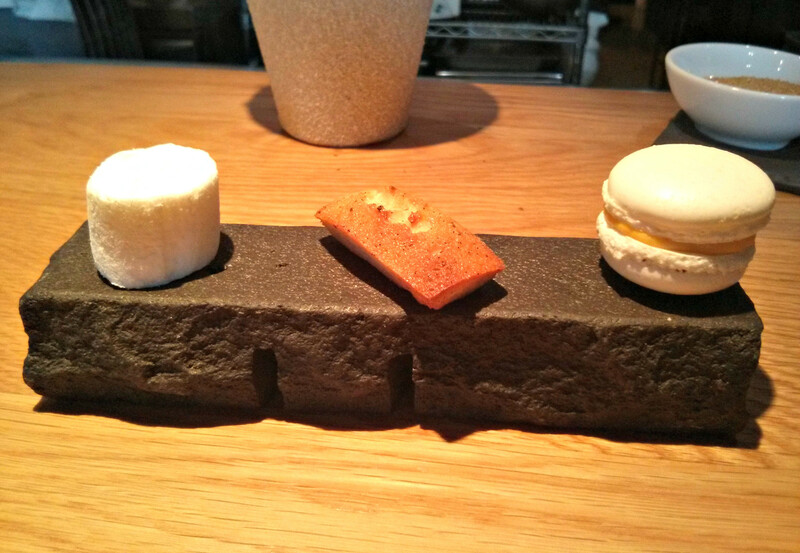 Finally, with some very good filter coffee blend some petit fours, a bergamot marshmallow, a exceedingly good financier and an outstanding vanilla and mango macaron. Hedone really does live up to its reputation, proving that if you source the best ingredients and produce available you can serve these precisely cooked and in clever recipes, achieve world class dishes and create a destination for anyone who loves their food. Both vegetarian and non-vegetarian menus were packed with excellent dishes, and very generous portions too, no finger sized morsels of meat for my mains! My praise for each course came with best kind of proof, the plates wiped almost shiny clean with some of the wonderful bread to be had. It's only a pity I live so far away, or I'd be joining the regulars sitting each side of us at the bar in visiting as often as I could. Service was great too, with knowledgeable, attentive and friendly staff. The bill came to £277. Turbot, smoked potato, potato skin emulsion, truffle. Duck egg yolk, asparagus, truffle. 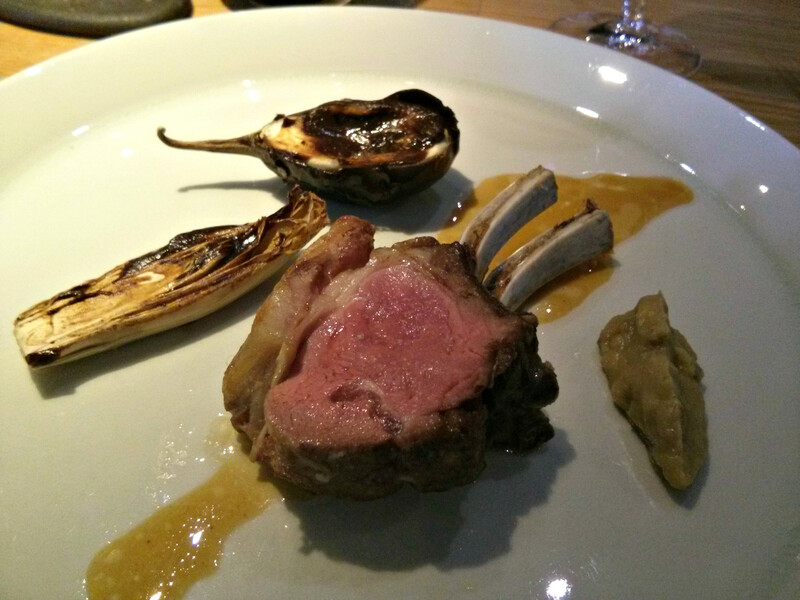 Salt marsh lamb, baby aubergine, endive, miso, smoked aubergine puree. 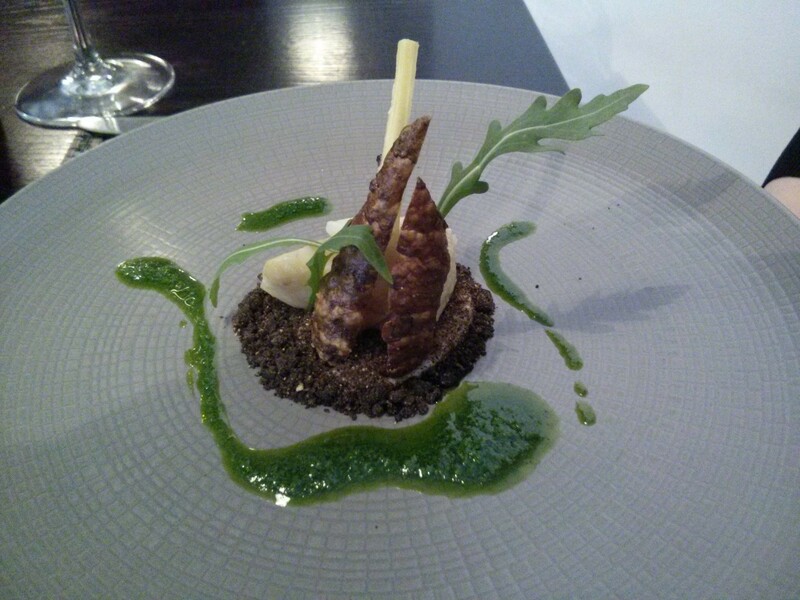 Ramson, baby aubergine, endive, miso, smoked aubergine puree. Watercress, parsley and morel risotto. Warm chocolate mousse, raspberry and chocolate ring, vanilla ice cream. 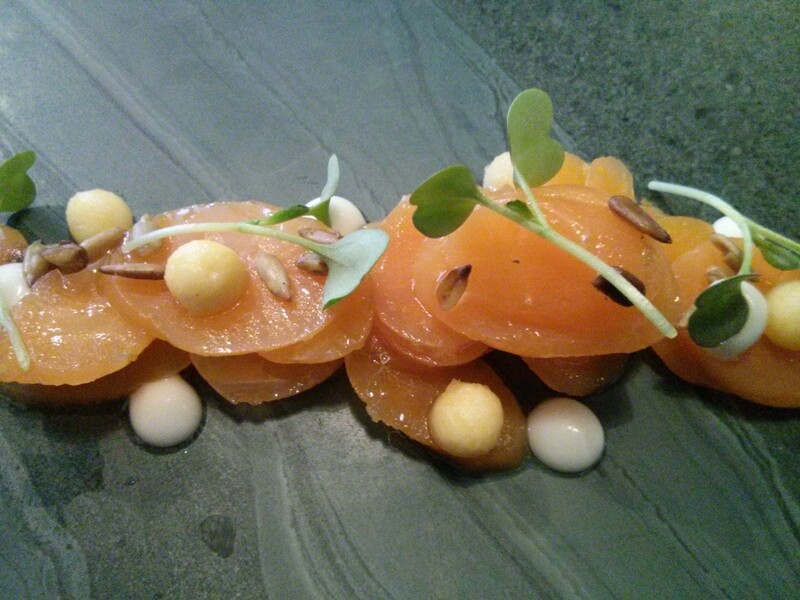 Roganic is a pop-up restaurant from Simon Rogan. It's coming up to its closing date in June and I wanted to try it out before the shut down so a lunch time booking saw us head up to Marylebone on a ridiculously cold and snowy Saturday in March. The restaurant itself is a sparse wooden floored white walled room, plain and very much a temporary space befitting a pop-up. We started with a likeable British sparkling rose from Balfour, my first experience of a British sparkling wine and enjoyed it. 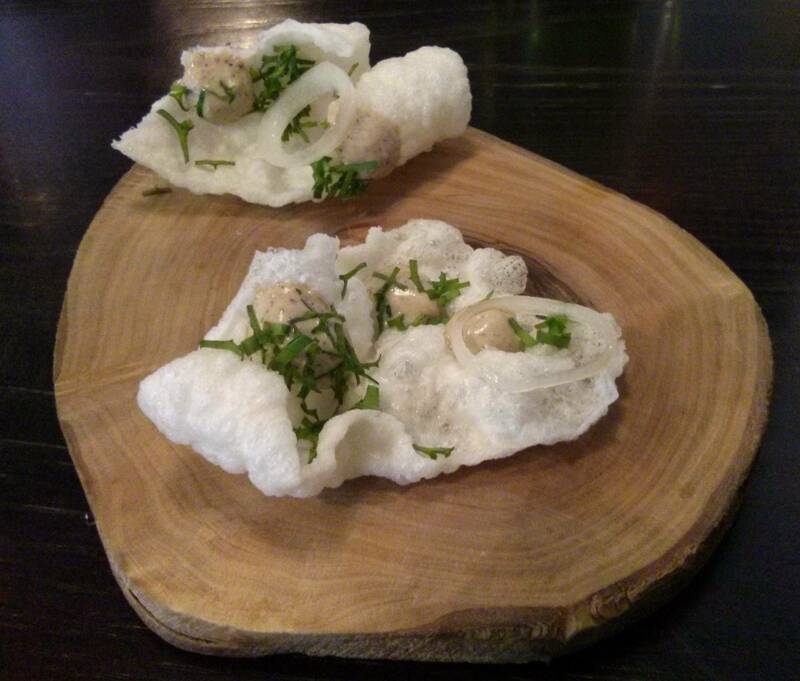 The first of the amuse bouche turned up before the menus. This was a cheese crisp, with shallot and a few drops of sauce. This was essentially a posh Quaver, with a lovely sweet and sour note from the juicy shallot ring. The next amuse bouche turned up in a iron pot, opened to a blast of sweet smoke from the hay within. 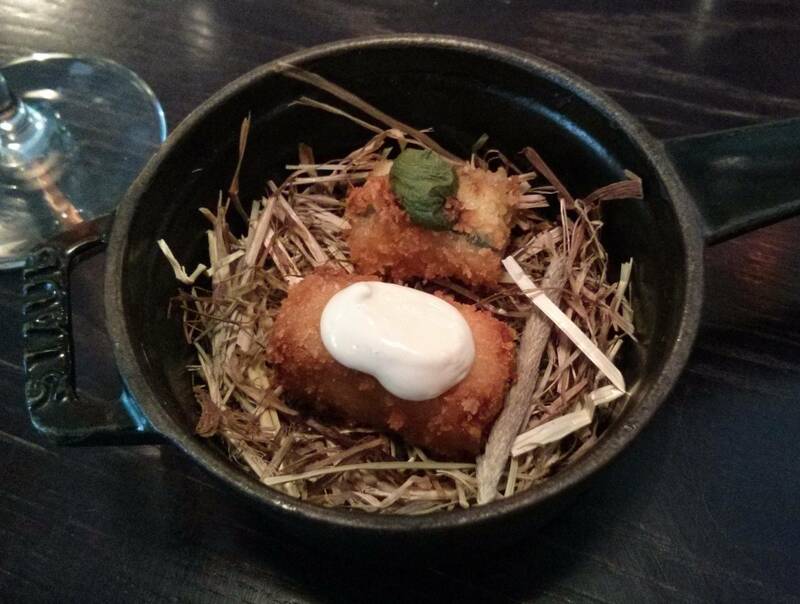 On the hay lay two croquettes, a fantastic salty, smoky, rich morsel of smoked eel and pork belly with a hay sauce on top, the second a rich cheese croquette topped with nettle puree. The waft of hay smoke was lovely, and as each table received this dish the room filled with the smell throughout the lunch in a most agreeable manner. Those who wish should ask for the vegetarian croquette to be served separately, as I noticed with some tables who arrived after us, perhaps it had been mentioned. The menus offered 3, 6 or 10 courses, and the only thing asked was that an equal amount of courses were chosen by us both. Although we had the choice to pick out courses from both vegetarian and non-vegetarian menus we both went for the 10 course from each. Vegetarian's are catered for very well, the vegetarian menu was just as varied and complex as the non-vegetarian which itself had a number of vegetarian courses. The influence of high quality produce from Rogan's Cartmel farm on the dishes is clear to be seen. 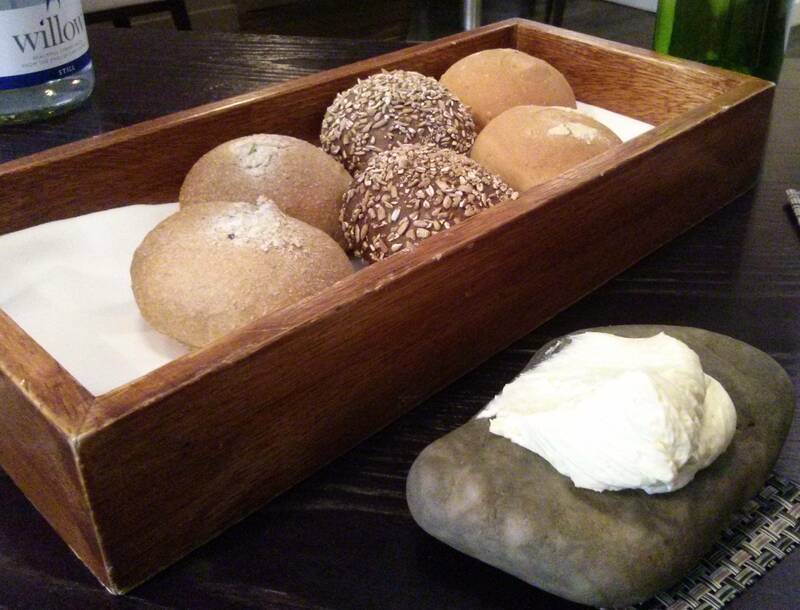 Bread was a generous selection of six warm soft rolls, a white, wholemeal, and cracked wheat covered rye. These were served with an excellent unpasteurised butter. The meal started with an unusual mushroom dish. A well flavoured incredibly light mushroom mousse, containing sweet pickled mushrooms was topped with a disc of mushroom caramel, itself topped with garlic drops and a blade of wild garlic. This innovative take on a burnt cream/crème brulee was a superb start to the menu, the sweet crunch of caramel balanced with the silky soft mousse and pickled mushrooms, the garlic drops and wild garlic a familiar accompaniment to the mushroom flavours yet the dish as a whole providing a whole new experience. A simply fantastic dish. Following this a bowl with swede dumplings, a handful of puffed barley resembling the Honey Monsters favourite food, a few leaves of nasturtium and hogweed was presented, into this a broth of vegetables was poured. The broth was particularly good, rich with tomato yet didn't overpower the dumplings or nasturtium. 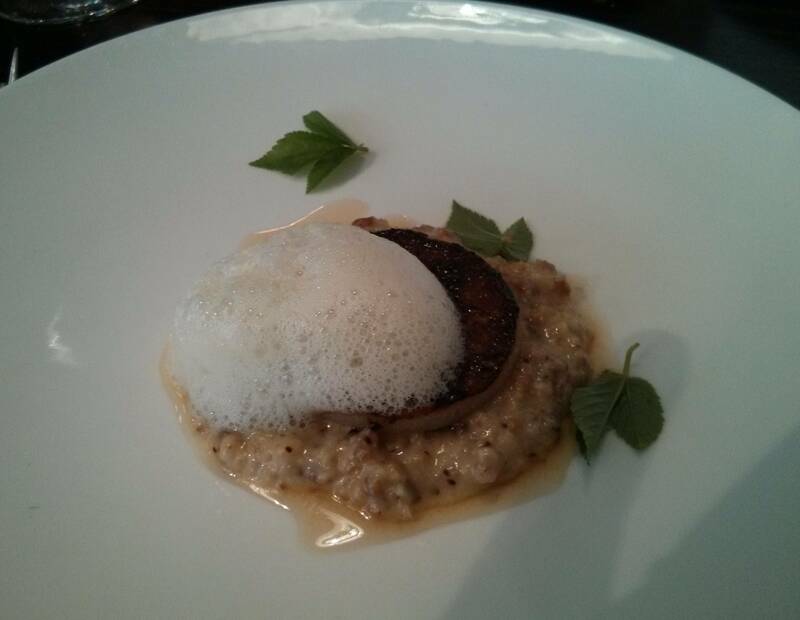 Following this a millet risotto, overlaid with a caramelised disc of pear, some celery foam, a pear syrup and a few elderberry leaves. The millet was rich with a blue cheese, Devon blue. Millet makes for an excellent risotto base, providing somewhat of a denser bite than rice, retaining the strong cheese perfectly, the pear sweet and flavourful, all coming together fabulously. The fourth course saw the first time we had variations of the same dish, a dish much applauded, both at Roganic and at the newly opened The French, in Manchester. For me cubes of raw ox, in this case veal pieces, with sunflower seeds, balls of pickled squash and turnip purée all overlaid with a highly unusual coal oil. For my wife the veal was replaced with carrots of outstanding quality from the Cumbria farm. The coal oil is sunflower oil infused with charcoal, and was a highly original taste reminiscent of coal itself, yet not overpowering the ingredients, instead providing a rich smoky taste. A very clever dish, unlike anything else I've had before, incredibly more'ish and worked equally well with both veal and carrot. Next up saw another vegetable dish, three types of artichoke, a chunk of lemony globe artichoke base, crisp shavings and soft bulb of jerusalem artichoke and purple artichoke. These rested on a crunchy malt soil on a base of Ragstone goats cheese puree, this was accompanied with rocket and rocket puree. The goats cheese was strong, and together with the crunchy soil provided the dominant flavours although without overpowering the artichoke selection. 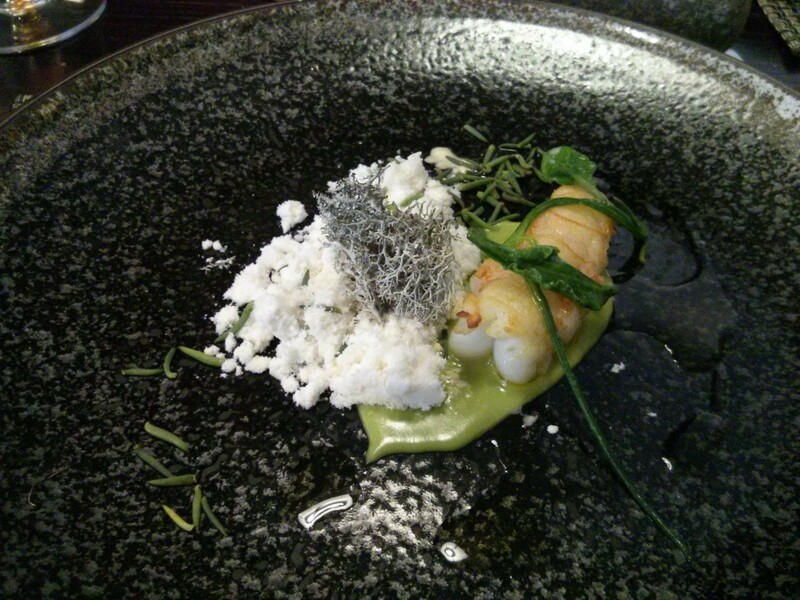 Next up was an excellent dish, a single large prawn from the Isle of Skye, just about cooked, with an unusual intensely flavoured oyster snow, a herb puree and sea herbs, and the unusual addition of reindeer moss. I've seen reindeer moss on a Ray Mears programme, where despite repeated soakings it was mostly bitter and inedible, however this was crisp dry sprig of moss, providing a subtle perfumed taste reminiscent of pine and winter and provided a crisp texture with the prawn and snow. I'm not sure how the snow was made, but melted like icing sugar in the mouth. All elements blended to a terrific dish again unlike anything I had before. My wife's course was a favourite of hers, providing a couple her of favourite ingredients, ducks egg and beetroot. 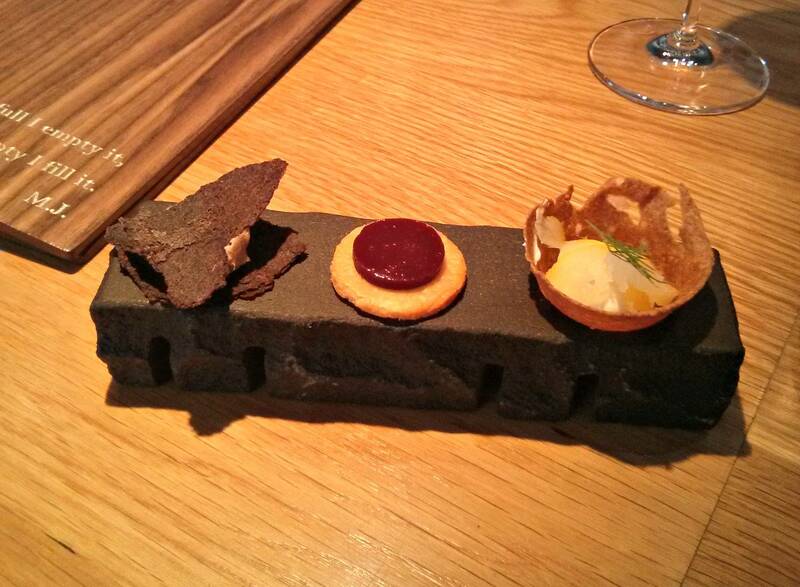 A smoked ducks egg yolk of considerable size accompanied beetroot whole and pureed, charred baby gems and sour cream. A flood of rich, sticky yolk coated the excellent beetroot to great effect. A fish course followed for me, an excellent fillet of Devon Lemon Sole, on a bed of fennel puree, some baby leeks, cockles and fennel stems. 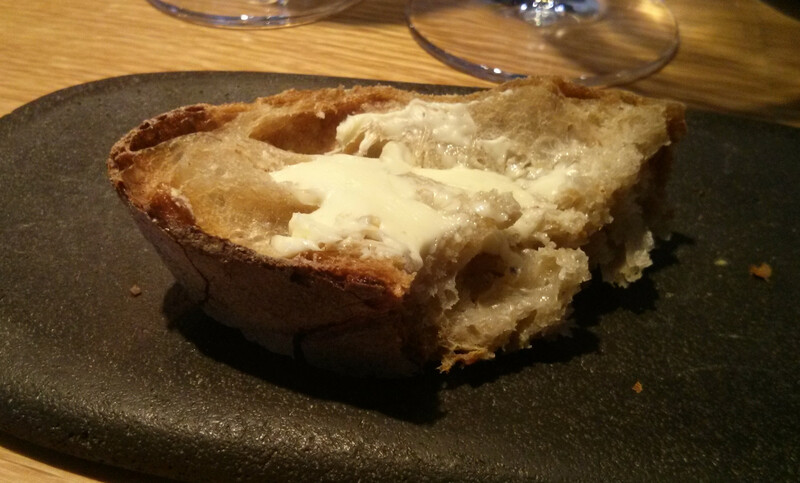 The sole was cooked to perfection, an intense aniseed note from the puree and cockles intense salty and savoury. The baby leeks were charred and fine examples of their kind. For my wife, 2 cores of a hay baked celeriac, brocolli whole and pureed, sage and crunchy vinegar rice. 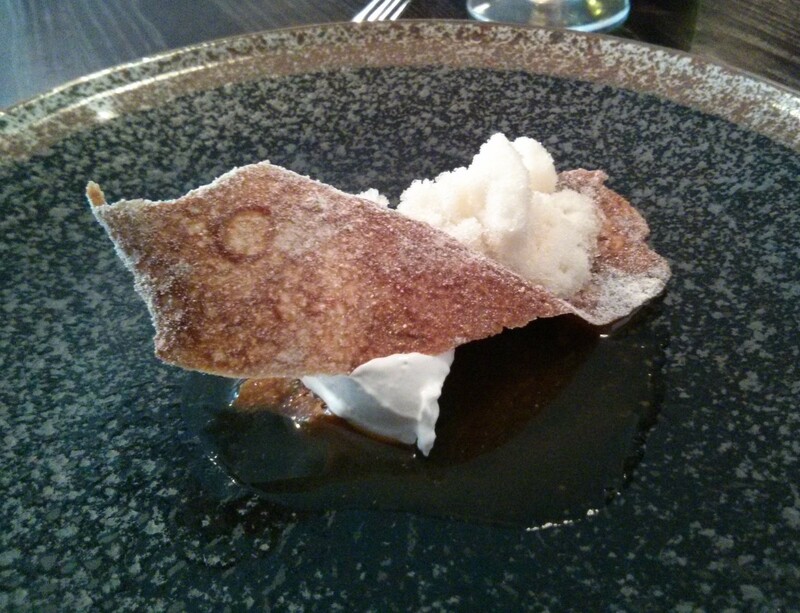 The celeriac was really good, soft and rich with butter yet retaining its flavour really well. My final savoury course was a superb combination of Linsdale beef cheek, bone marrow, salsify, buttermilk sauce and Alexander for me. The richness of the cheek and marrow was balanced with the fresh buttermilk sauce, sweet salsify and together with a fantastic gravy provided a sure fire winning end to main courses.My wife had a lovely piece of cauliflower, likely cooked whole in a pan, browned with a caramelised edge accompanied with buckwheat, a hint of pine and a rich and decadent brown butter sauce. We opted for a supplemental cheese course, but shared one between us. This was a very nicely presented slate with shavings of an Isle of Mull cheddar, celery, apple, pickled walnuts and crisp bread. I'm a sucker for a good piece of cheddar, and each element piled on the shaving was a really excellent mouthful. I really enjoyed this. The first dessert was crisp tuile, with a gorgeous buttermilk ice cream, a minty snow of granita and a syrup of sea buckthorn. This was an innovative and again unusual dish, the bitter note in the sweet sea buckthorn syrup partnering the creamy buttermilk ice cream and mint granita and sweet crunch of the tuile in a pleasing fashion. 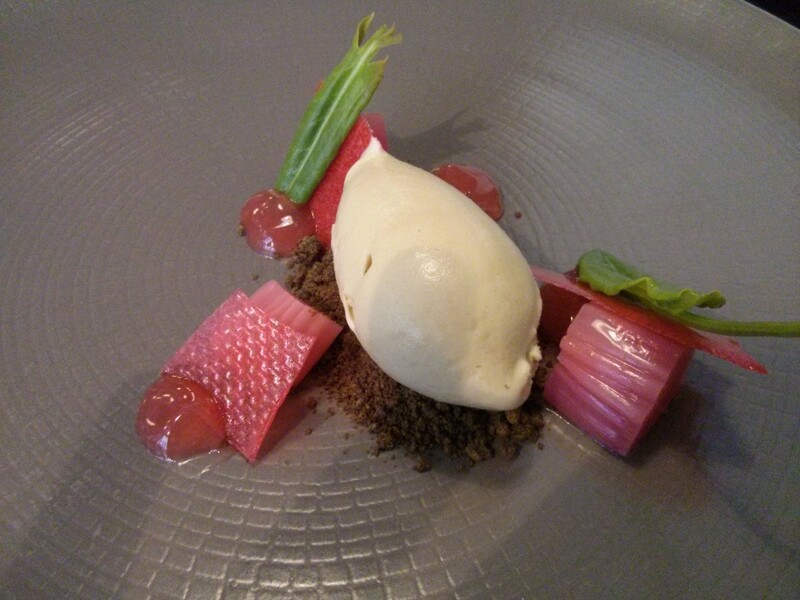 The second dessert was a selection of poached forced rhubarb, gel and crisp, with a honeycomb ice cream, sorrel and pile of gingerbread crumb. The rhubarb itself was lovely, with a decent bite, earthy yet not to sweet nor sour, the creamy honeycomb and ginger biscuit were familiar pairings and a great plate. The sorrel leaves had a pleasant citrus flavour and were lovely dipped in some ice cream. 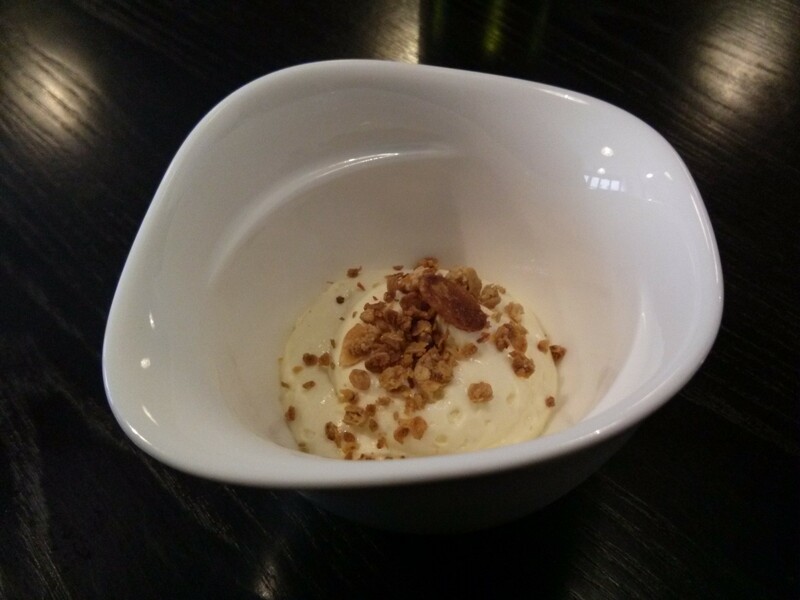 Rather than petit four's, a third dessert was presented, a bowl of apple mousse on some stout jelly, and topped with a crunchy granola. The jelly retained its stout flavours really well, and mousse was light without being too rich, with a good apple flavour. All desserts were excellent. My wife tried a glass of The Flower and The Bee with the first few courses, an excellently named Spanish white, and I had something quite different, a bottle of Camden Pale Ale, unlike any beer I've had before, light, terrific smelling and good enough that we ordered another bottle for my wife too. 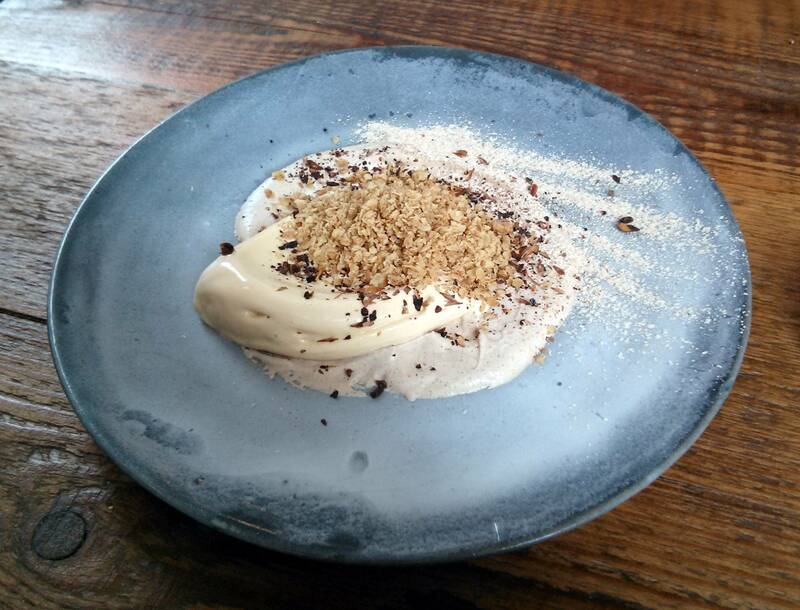 Although it's only open for a few more months, Londoner's who haven't been should really try and fit in a meal at Roganic to sample Simon Rogan and Andrew Tomlinsons dishes. The food is innovative modern British cooking of the highest order, and excellent ingredients are used, especially those originating from the Cartmel farm. Although the room is plain and a tad noisy, it's there with the realisation this is a temporary space. The staff are friendly, attentive and knowledgeable, and all understand the dishes and ingredients really well showing a great deal of enthusiasm for the food. Vegetarians are on an equal footing with non-vegetarians, with some sophisticated and complex vegetable dishes standing shoulder to shoulder with the meat and fish dishes. The bill came to £246. A new permanent home is being sought for Roganic, no places or timescales being mentioned as of yet, and a similar ethos and food can be found at the newly opened The French in Manchester's and of course at L'Enclume and the other Cumbrian ventures. Mushroom burnt cream. Mushroom caramel, mousse, pickled enoki's, garlic drops and wild garlic. 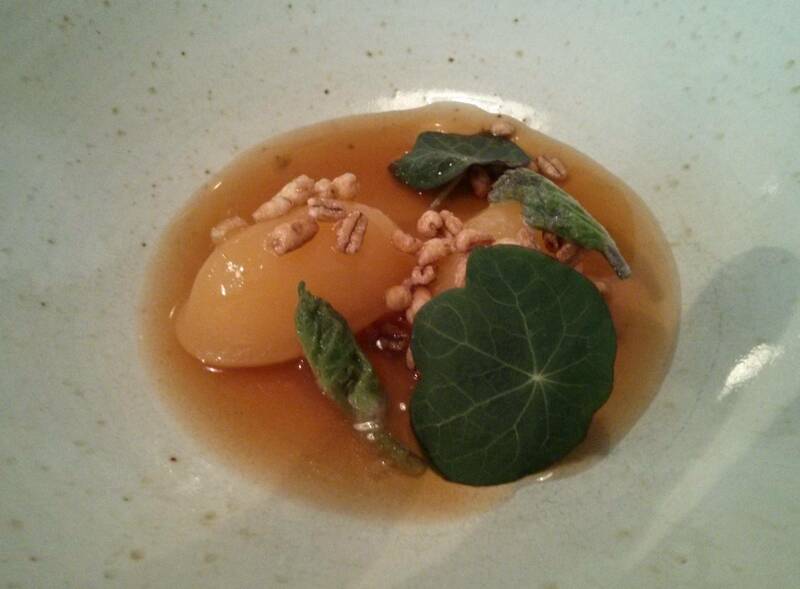 Swede dumplings, nasturtium, hogweed, barley, vegetable broth. Millet, Devon Blue, pear, celery foam, elderberry leaves. 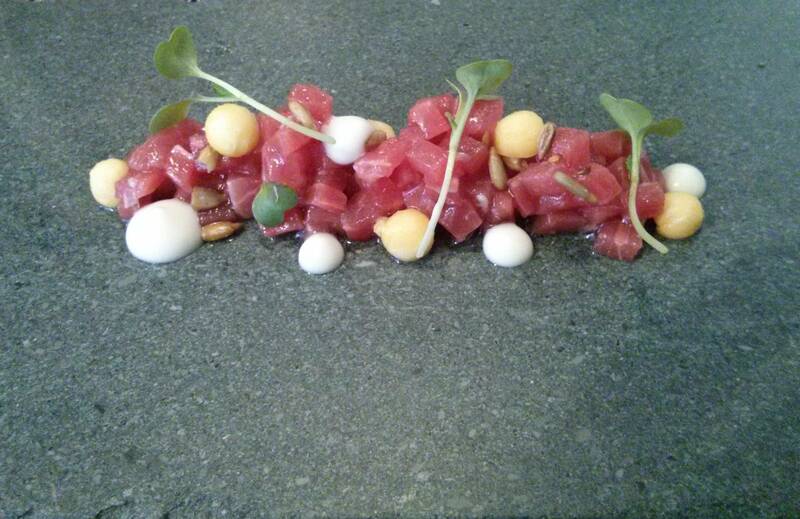 Raw ox, coal oil, sunflower seeds, squash, turnip puree. Carrots, coal oil, sunflower seeds, squash, turnip drops. Selection of artichokes, malt soil, Ragstone goats cheese, rocket. Prawn, snow, sea herbs, reindeer moss. 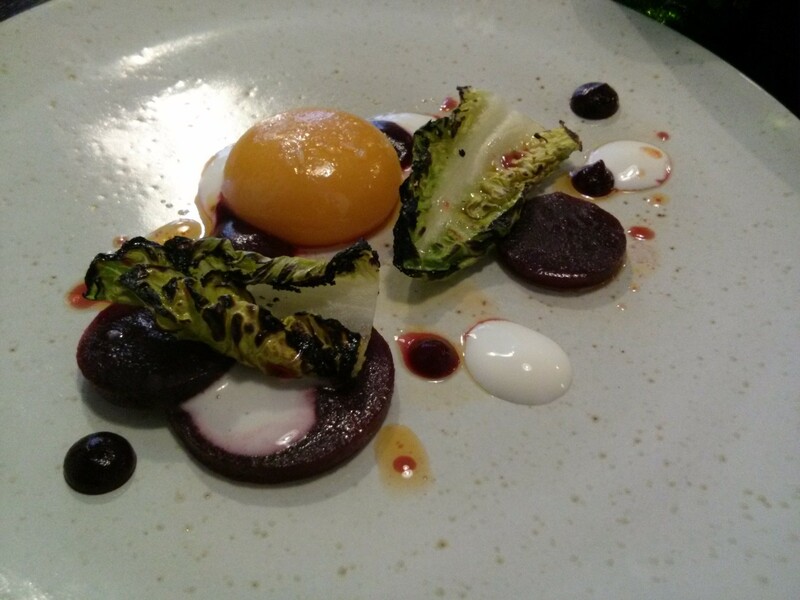 Smoked ducks egg, beetroot, charred baby gem, sour cream. 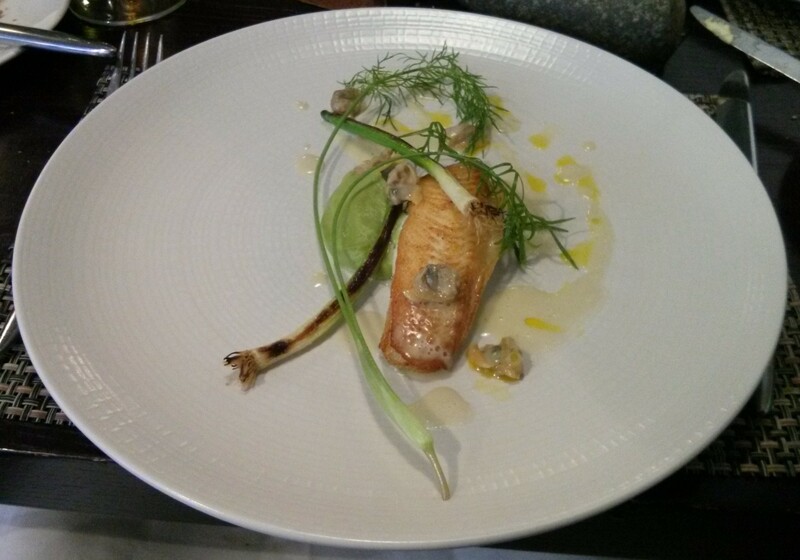 Lemon sole, fennel, cockles, baby leeks. 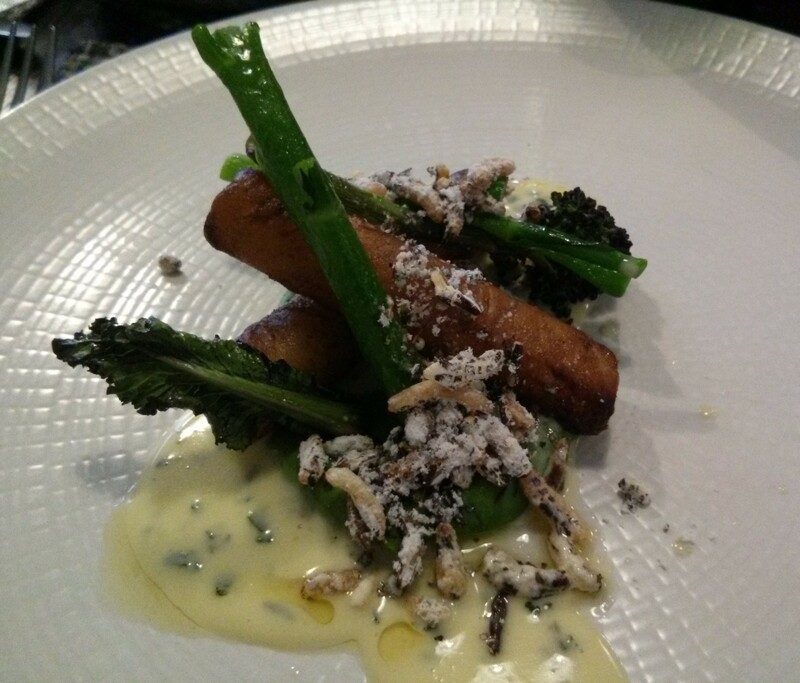 Hay baked celeriac, broccoli, vinegar rice. Linsdale beef cheek, buttermilk sauce, celeriac, Alexander. 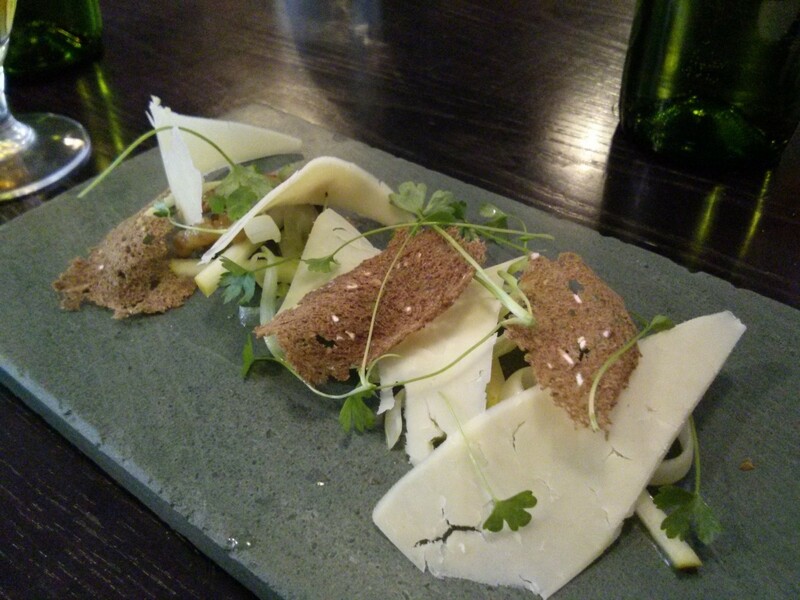 Isle of Mull cheddar, crispbread, celery, apple, pickled walnuts. Tuile, buttermilk ice cream, mint granita, sea buckthorn syrup. Apple mousse, stout jelly, granola. 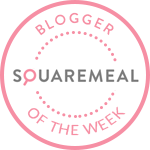 Blog of the week on Square Meal ! As I'm becoming more active on other social networks and promoting this blog a bit more it's nice to see some recognition. Over the next few weeks I hope to add a list of restaurants that offer vegetarian menus, with an emphasis on fine dining, starred restaurants, tasting menus and the like, as well as more content. Kitchen Table at Bubbledogs, The Ledbury and hopefully one of Nuno Mendes Craft evenings have been booked and many more meals have been planned.